Something new from Revlon comes. And if you caught the blatant paraphrasing of MacBeth kudos to you! 😛 If not nevermind, there is something new from Revlon that is at once gimmicky yet alluring. A foundation that self-adjusts to match your skin tone? How is that so? 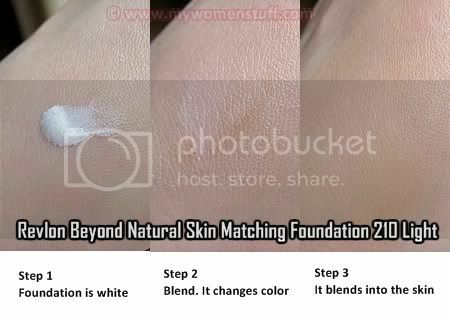 This is the new Revlon Beyond Natural Skin Matching foundation which I received in 210 Light and which you might have seen around in stores for about a month or so. It was just launched in December 2008. 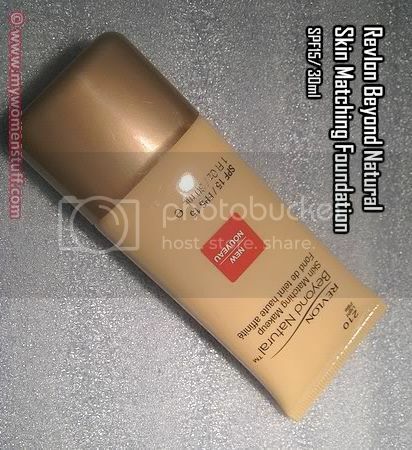 The Revlon Beyond Natural skin matching foundation is quite an innovative product. Coming in a small 30ml tube, it looks rather like a tinted moisturizer. When you squeeze it, out comes a white cream with little black beads in it. Is that foundation? You might wonder. How can it be foundation when it is so WHITE?! Ah, that’s when the magic happens. What the Revlon Beyond Natural skin matching foundation does is turn from white to a colour approximating that of your skintone. You still have to choose from a range of 5 colours from Light to Deep. If it was magic, it’d come in just one colour. When I first spread it, I thought the colour was a little too dark. After a short while (and after I’d spread it thin enough) the colour sort of approximates that of my skin. I did find that there is a yellowish-pinkish tone to the Light formula and it is a half shade darker than what I’m used to, but I’ll survive. Texture wise, it is very smooth and creamy and feels nice going on the skin. Coverage however is very sheer, rather like a tinted moisturizer. It is good for those days when you don’t want to look too made up or if you don’t have many flaws to cover up or if you like sheer foundation. Otherwise, you might be disappointed by the coverage. I’m comfortable with my flaws peeking through once in a while so I rather like the Revlon Skin Matching foundation for weekends or for days when I’m in a hurry. After dusting some loose powder over the foundation, its all set for the day. No slipping, no sliding. Not bad I felt. Is this Revlon’s version of a BB Cream? The Revlon Beyond Natural Skin Matching foundation retails at RM59 for 30ml at all Revlon counters. A little pricey for something from the pharmacy, but I think its alright. Pros: Contains sunscreen, Creamy, Lasts the whole day, Fun! NEXT POST: Is Coffee good for you?